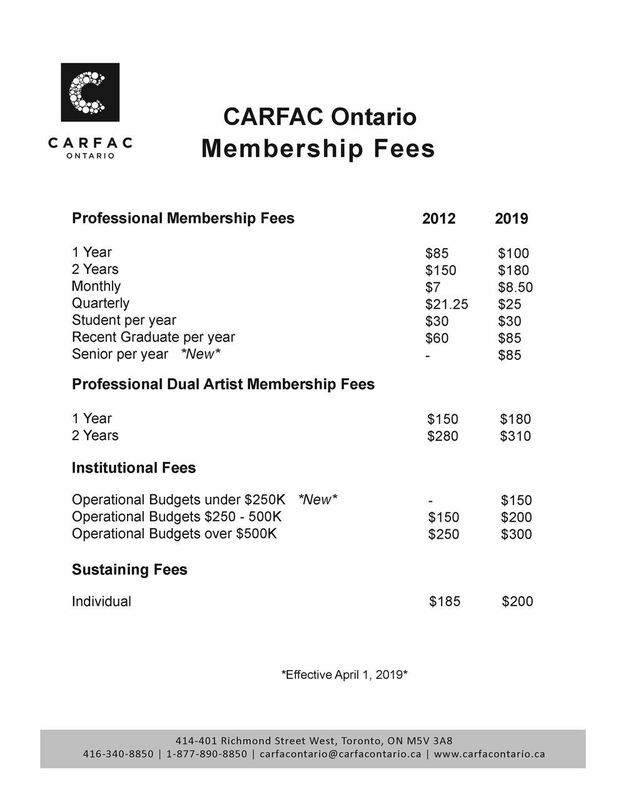 Join - become a CARFAC Ontario member today! Please select the membership category below and follow the instructions (new members only). New prices in effect for April 1, 2019. More information about Individual Membership benefits and Institutional Membership benefits. A1 - Individual Associate - $100.00 (CAD) Subscription period: 1 year No automatically recurring payments Any individual with an interest in the visual arts in Ontario. A2 - Institutional Associate (budget between 250K - 500K) - $200.00 (CAD) Subscription period: 1 year No automatically recurring payments Any institution with an interest in the visual arts in Ontario with budget between 250K - 500K. A2 - Institutional Associate (budget over 500K) - $300.00 (CAD) Subscription period: 1 year No automatically recurring payments Any institution with an interest in the visual arts in Ontario with budget over 500K. A2 - Institutional Associate (budget under 250K) - $150.00 (CAD) Subscription period: 1 year No automatically recurring payments Any institution with an interest in the visual arts in Ontario with budget under 250K. AS - Student Associate - $30.00 (CAD) Subscription period: 1 year No automatically recurring payments Any full-time student with an interest in the visual arts in Ontario. Please note that proof of full-time enrollment will be required. IM - Introductory Membership for Recent Graduates - $85.00 (CAD) Subscription period: 1 year No automatically recurring payments Any artist who graduated in the past two years. Please note that a copy of most recent student card will be required to confirm recent graduate status. RA - Professional Artist Member (Automatic Renewal) - $100.00 (CAD) Subscription period: 1 year Automatic renewal (recurring payments) This is a recurring payment option - you will need to cancel the payments on PayPal in order to cancel your membership. RA - Professional Artist Member (Monthly Payment) - $8.50 (CAD) Subscription period: Monthly Automatic renewal (recurring payments) Monthly payments of $7.00. This is a recurring payment option - you will need to cancel the payments on PayPal in order to cancel your membership. RA - Professional Artist Member (Quarterly Payment) - $25.00 (CAD) Subscription period: Quarterly Automatic renewal (recurring payments) Quarterly payments of $21.25. SN - Senior Membership for Individuals 65+ yo - $85.00 (CAD) Subscription period: 1 year No automatically recurring payments Any artist 65 years old or older. Please note that your date of birth must be listed in your profile. This information is not available to the public. ST - Sustaining - $200.00 (CAD) Subscription period: 1 year No automatically recurring payments Like our regular professional artist membership, a sustaining membership is an allowable business expense, and helps to sustain our current programs and services. please call or email ahead.